AMSOIL Premium Protection Synthetic Motor Oil is formulated to provide superior protection and performance in a wide variety of demanding applications. 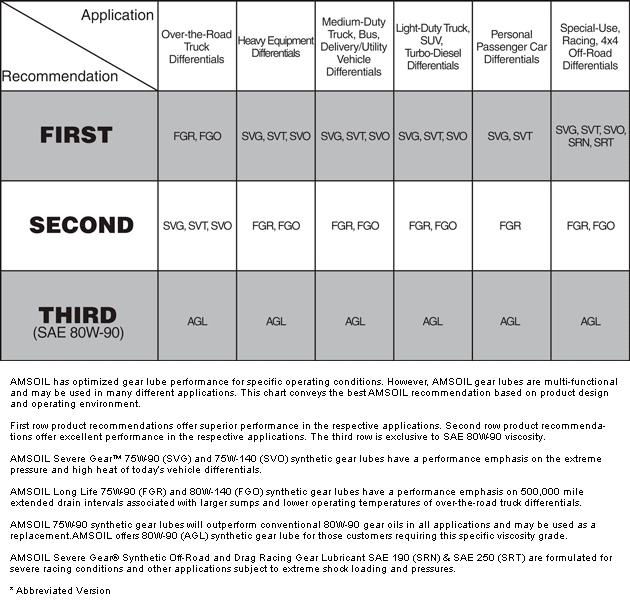 Its unique combination of synthetic base stocks and a superior additive package results in a formulation that exceeds the requirements of most gasoline or diesel applications that call for 10W-40 motor oil. Premium Protection Synthetic Motor Oil is ideal for high-mileage vehicles and high-stress vehicles subject to hot temperatures, heavy hauling, trailer pulling or off-road use. It provides the extra anti-wear protection required by engines with flat-tappet cams and high-tension valve springs. AMSOIL Premium Protection Synthetic Motor Oil offers flexibility and performance beyond conventional oils for convenience and trouble-free operation. AMSOIL Premium Protection Synthetic Motor Oil is specifically formulated to overcome the thermal deficiencies common to conventional petroleum oils. Volatilization (burn-off), oxidation and excessive deposit formation from high heat are greatly reduced. Viscosity thickening is controlled and engines run cleaner, promoting cooler operation and long engine life in air or liquid-cooled engines. • Normal Service - Up to 25,000 miles or one year, whichever comes first, or longer based on oil analysis. 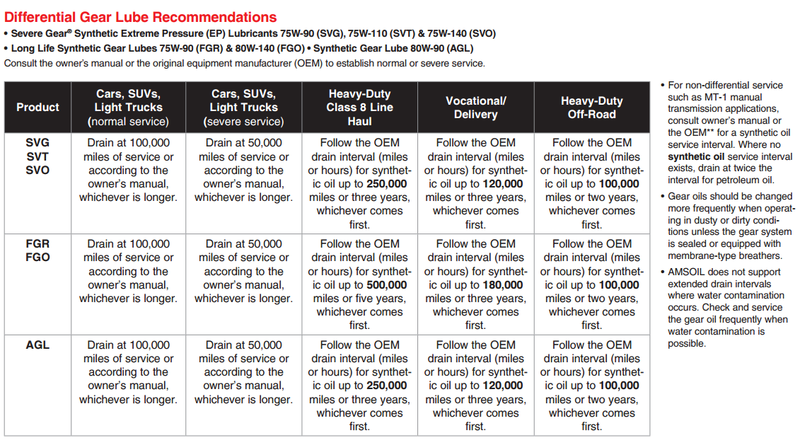 • Severe Service - Up to 15,000 miles or one year, whichever comes first, or longer based on oil analysis. • Normal and Severe Service - Up to 15,000 miles or one year, whichever comes first, or longer based on oil analysis. 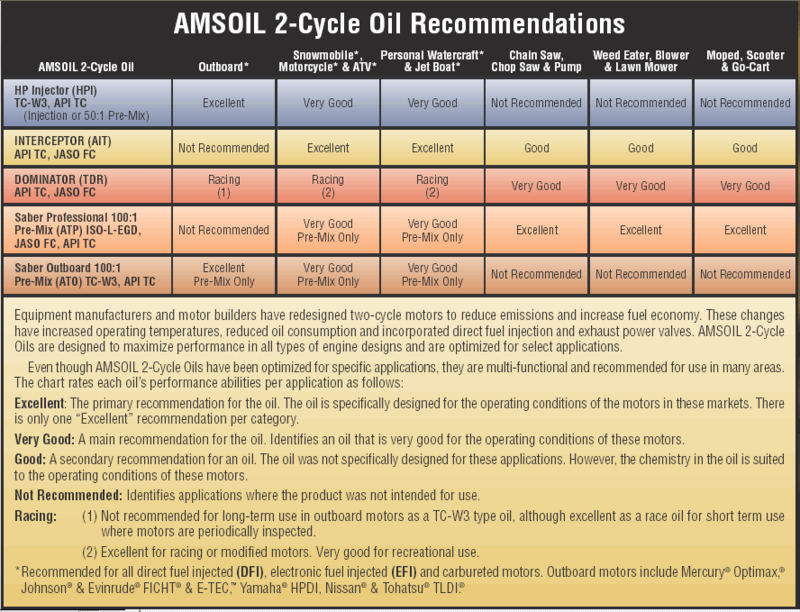 Click here to view the MSDS Data Sheet for AMSOIL AMO. Votes & Reviews: 44 vote(s) and 35 user reviews. Have used Amsoil products (used to sell it) since 1974 in all of our better vehicles and farm equipment. With annual or semi-annual changes of engine oil, never an issue related to lubrication and sludge or varnish buildup is a thing of the past. I have been using Amsoil in my cars that I drag race for 12 years...never an issue....Amsoil is by far the Gold standard of motor oils . This oil has a very strong cleaning aspect. When I drained the oil the first time I used it in a motorcycle with 17000 miles on it, it came out looking like thick almost gloppy molasses. Very black and quite thick. Subsequent oil changes have resulted in the oil coming out much cleaner. So much so that I can see light through the stream of oil as it is draining from the engine. I recently removed a side cover to inspect the clutch plates. The inside of the engine is clean like it was new. I'm very happy with this product. I run AMSOIL 10W/40 in both vehicles a 2006 Tundra Limited, a 2012 Dodge Caravan and my John Deer 300X Riding mower and in every vehicle I have owned over the past 40 years. When 50w AVOIL was available I ran it in my 1977 Cessna 172N. Put 7qt. in my 68 Charger and I am very happy with results. Not the cheapest, just the best. After tearing down my motor after 250hr for rebuild/refresh, my rod, cam, and crank bearings still looked new. Keep in mind this isn't a pampered motor. It gets run hard, yet the rebuild seemed completely unnecessary. I am a firm believer in Amsoil. This oil helped me out with my 75 chevy 350. It took away an engine tick. It also runs and idles a lot smoother. Excellent product. I love the high zinc oil! I've been using this oil in my drift cars for years now, and have gotten to tear a couple motors down for rebuilds ( due to low compression) and got the opportunity to see that the oil has Done it's job! It kept the engin clean inside, and protected the bearing like it was supose to! My application is a 2013 Toyota RAV4 with 15k miles. I use 10w-40 Amsoil and change just once a year since I normally drive about 3800 miles a year anyway using Amsoil Full Synthetic.. I feel more confident using this and changing it myself the first several years as opposed to letting Toyota change it for FREE with regular oil every 6 months. Basically I can do it myself once a year and still save time from waiting around at a stealership lobby and have confidence I will not sludge up ever with better protection. Not to mention I know I do it right and tighten everything back up. I personally had some bad experiances in the past and do not trust them working on my car since I bought it new. One time the spark plugs were apparently never tightened as an example on another new car we purchased during a service. All I have ever used in my motorcycles. Runs noticeably cooler and longer between changes. Couldn't use in the old 1942 Harley though. Leaked out too fast. I'm 60 years old and have used every possible lubrication known to man, Amsoil is by far the best. I use the Amsoil high zinc formula in a high reving 4cyl application . The oil pressure and temp are never an issue while on the track and I like the extra protection that the zinc provides for the camshaft and shim buckets. I use this product in my work van with an oil bypass filter along with my stock oil filter, my van has over 340,000 miles and has had the oil bypass filter since it was new and I truly believe that Amsoil has kept me on the road this long. I think the 91 Yotas gonna love it! The Yotas Gonna Love it!. I was Surprised to see it, down the way, at a cig store of all places! Fine with me. I treat the motorr in the truck,lol better than myself! I've tried all the good stuff - from "German Castrol" to Redline to Royal Purple to Rotella etc. From 0w to 50w in all kinds of weather. From the '62 max wedge Savoy to the '88 w150 roller 318 - this oil works best for my Mopars whether it's the Canadian winter or the West Texas summer. Good pressure at hot idle, excellent flow and fast cranking in -40 (good battery helps). My tweaked '81 high compression W150 is my daily driver and gets 13/18 mpg with non ethanol Shell 91 and Amsoil AMO. 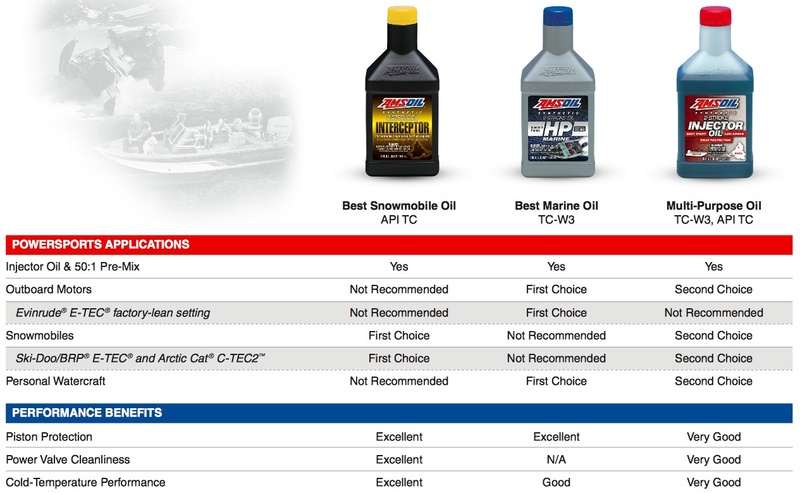 I don't bother with UOA of Amsoil anymore, this oil is always on top. I change the oil and filter once a year and it doesn't need topping up between changes unless I'm towing 3000 miles to TX in the summer - about a pint. Anne & Alex Farkas give me personalized service - thanks folks!